It was a great time to be a car lover in the early 1970′s. There were Pony Cars, Muscle Cars and even Personal Luxury Cars. If you wanted it, more than likely someone in Michigan made it. 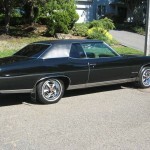 In an effort to capture all the sales that they could, Pontiac introduced the Grand Ville in 1971 as its flagship, top-trim model, full-sized car. 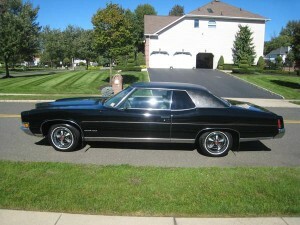 In 1971 Pontiac pushed the Bonneville down a notch to replace the discontinued Pontiac Executive. To fill the slot of it’s top-tier car, Pontiac created the Grand Ville. The Grand Ville was built on a stretched version of the GM the B-body. The regular B-body was used by the Pontiac Bonneville and Catalina. The Grand Ville would share a lot of the trim and design elements of the Bonneville. 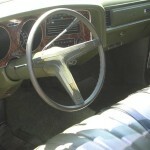 Even though it had a slightly larger wheelbase, the Grand Ville had identical interior dimensions of the Bonneville and Catalina. 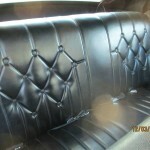 As the flagship Pontiac of its time, the Grand Ville has more luxurious interior trimmings than the lesser Pontiacs. It initially has distinctive chrome up front and taillight trim. Standard equipment on Grand Ville included a 455 cubic-inch V8 engine for the 1971-74 models, Turbo-Hydramatic automatic transmission, power steering and power front disc brakes. Options included air conditioning, power windows and driver’s seat, tilt steering wheel, cruise control, AM/FM stereo with tape deck and much more. Changes over the years were few. For 1974, the Grand Ville had its own parking lights, which wrapped around the corner of the front fender. 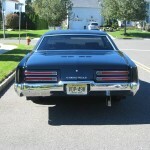 1973 to 1975 models were available with rear fender skirts. 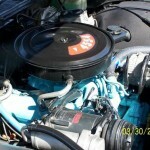 In 1975, the 455 engine became optional and a 400 cubic-inch V8 was made standard. The Grand Ville was moderately successful from 1971 to 1973. 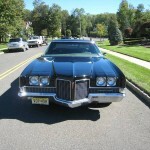 Than all things that were wonderful in 1970′s cars were killed by a one-two punch. The first punch being the Arab Oil Embargo of late 1973 and early 1974. Gasoline shortages, long lines at filling stations, and skyrocketing pump prices killed the demand for large, big-engine cars. The second punch was the U.S. government. Fuel efficiency, safety regulations and catalytic converters robbed all cars of any power and any fun. 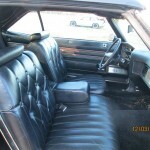 To fight diminishing sales, the Grand Ville became the Grand Ville Brougham for 1975 and included more standard equipment than in previous years, such as power windows and a carpeted trunk. 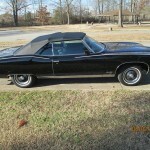 But it was not enough to save the Grand Ville, 1975 would be the final year for the model, which also included Pontiac’s last convertible until 1983. For 1976, the Grand Ville nameplate was dropped and the car was renamed Bonneville Brougham, returning that nameplate back to its former flagship status. 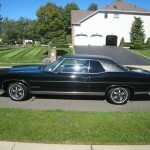 To learn about other classic Pontiacs, see the posts on the 1969-1972 Pontiac Grand Prix or the 1964-1967 Pontiac Tempest. To find your own Classic Car or to sell your Classic Car, see the listings in Classics for Sale. 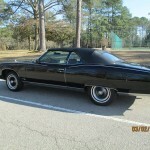 This entry was posted in Grand Ville and tagged B Body, Bonneville, Catalina, Delta 88, Eighty Eight, Impala, Lesabre. Bookmark the permalink. A place where cars are a part of our family. We invite you yo join in our passion and share your cars and your stories about cars. Not a Street, Road or Interstate, but a rout to travel, adventure and destinations. Business Advisors, Business Support, Business Coaches. Specializing in Startup, Technology and eCommerce Companies. Check our blog for tips and advice. 877-663-1305. A North Carolina virtual law office working with business on incorporations, contracts, leases, employment agreements, patents and trademarks and other business legal needs. 919-415-1777.